One o'clock on Monday morning and Graham and I weren't feeling at our best. Getting up in the middle of the night is always unpleasant, and we had had considerably less rest than before Jura. Just as well Arran was the last of the runs! In our befuddled state we messed up navigation leaving Lamlash, and it seemed to take us an age to reach Dun Fionn and the tramp down to Brodick. Thanks to motoring and making it round the tidal gate at Kintyre we had gone from the back of the field to being up with some of the elite runners, and boy, were these teams moving, headtorches approaching in the dark and passing in a flash of reflective fabric and grunted 'well dones' and 'keep it ups'. There's nothing like hanging out with a bunch of fell runners to make you feel unfit! Graham found the Arran Trading Company slogan - 'Bangkok, Brodick, Delhi, Katmandhu' - hilarious. On investigating their window we discovered they sold ethnic nik-naks rather than trading Arran cheese and whisky for tea and semiconductor parts! Goatfell hurt, and was incredibly windy higher up, but we made it for dawn and spent a minute taking it in. All downhill from here. Despite walking the whole route our legs were tired, and we were glad to reach Dun Fionn and see the end in sight. As we waited for our lift back out to the boat, a bunch of competitors arrived from the next tide, got their kit checked, then set off running. Running! Graham and I shook our heads. It would take more than a jog round Arthur's Seat twice a week to compete properly in this race next time. Back on Phoebe another decision was made, to head for her home port of Largs rather than the official race end at Troon. 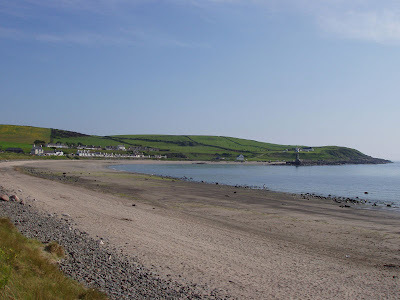 As we had already forfeited the race it wasn't a hard decision, and we arrived in Largs at lunchtime, the bliss of a shower and the soporific effect of a beer on deck in the sunshine. Graham and I presented the sailors with a memento from the summit of each of the hill sections of the race. Would we do this next year? I don't fancy the Paps again, they are too unstable to go round fast in safety. On the other hand the five guys on the boat got on very well, we learned a lot about the race and would hopefully do better next year, and though the fact we won't get an official time won't become a regret, it would be nice to complete the race properly. We'd have to train for it though. Dare we immerse ourselves into the world of fell running...? Leo worked out the timing for our route ahead. "We might just make the tidal gate round the Mull of Kintyre," he said. We sailed into a fog bank approaching the Mull and with visibility down below 50 yards put the engine on for safety. Graeme popped up from the cabin and handed me a novelty horn. "Blow this every two minutes," he said. "Aye, right!" I said, thinking that this was some sailor humour. But no! It was a foghorn. Even if it did make a noise like a kazoo. We made it round the Mull and dramatically sailed out of the cloud into a sunny, breezy channel, mist streaming off the cliffs of the Mull like the Lost World. Engine off, the mainsail was reefed in the wind, and we made a fair clip past Sanda and into the Firth of Clyde. Graham and I went below for some kip as the sailors navigated us to our final destination. Graham and I woke to the sound of the engine. The tide had turned but the wind had not risen. We were motoring to Craighouse and had thus forfeited the race. But we all felt it was the right decision: we were still determined to complete the course and sail when possible, even if we were no longer in the honours. Phosphoresence glowed round the boat, and we set off about half four on Sunday morning, deer grazing by the roadside. We were out the race, but personal pride meant we still wanted to complete the course in as good a time as we could. Another crew caught us up at Jura Forest Lodge, but we left them behind once on the hill. This wasn't surprising. They had rowed all through the night and looked knackered, whilst Graham and I had enjoyed a full 24 hours rest in gentle seas. 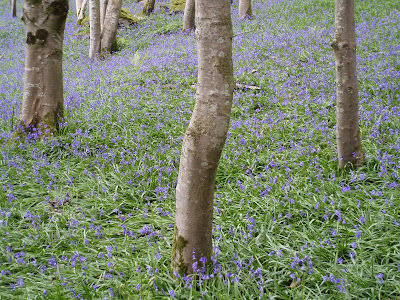 The paps were unpleasant: I've heard them called 'the graveyard of fell-running shoes' and now understand why. The screes ripped my flimsy shoes and we were glad to get down off the last hill without damage bar a couple of stubbed toes. I have to take my hat off to those crazy bastards who run down this ankle-breaking stuff. We tried some ineffectual running back along the coast road, and stopped to chat to some tourists. "Jura's great, for example..." the man said, "but wait, I'm not going to tell you about it! We want to keep it to ourselves!" Cuckoos called in the trees. 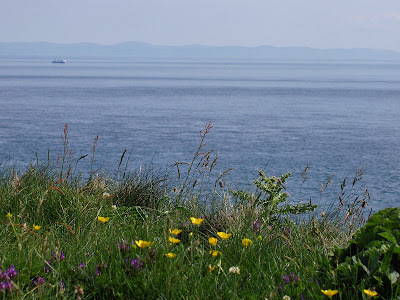 It seemed a shame that our first visit to Jura was so short, but what was that in the bay - The Blue Pearl! They'd made it down the west side of Jura without being sucked under in the Corryvreckan: a journey worthy of their darker namesake. Late on Saturday morning I climbed up to the cockpit to see where we were. We'd been gybing like mad and seemed to be moving at a respectable lick. My eyes screwed up in the daylight and picked out a small Calmac ferry... a ruined castle... some white houses... Lochaline! We'd only gone a few miles. Saturday was a long hard sail for the crew: not because of high winds, but the opposite. The field was highly scattered, a bunch of sails in front of us and half a dozen behind, everyone else out of sight, no one moving particularly fast. By the Firth of Lorn, The Blue Pearl was closest. We were moving - slowly - and it looked like we would get to Craighouse at some point in the night, ten o'clock or midnight. If so, we were still in the race. But the wind died completely, and after being spat through the tidal race on Lunga Sound the tide slackened too, and we were left adrift for a couple of frustrating, but pleasant hours, watching seabirds and seals. Snorts of exhaled breath on the glassy sea heralded the arrival of a pod of porpoises, swimming uncharacteristically close, within six feet of the boat. A touch of magic. As the tide changed we started to drift backwards from the north end of Jura into Corryvreckan. Decision time: we motored into Kinuachdrachd Bay and laid anchor. If the wind picked up by the time the tide turned, we'd motor back to where the engine was switched on and continue the race. If it didn't pick up, we couldn't make Troon for our self-imposed late-Monday afternoon deadline. We watched The Blue Pearl - under oar - being pulled backwards into the Corryvreckan as dusk settled. We hoped to see them again. Thanks to some fine seamanship we'd clawed our way up the field by Salen, Graham and I looking at each other in astonishment as we set off jogging for the first checkpoint. It was really happening! "It would be good to get to the first checkpoint before being passed by the lead team," I said, only for Mark Hartell and Alex Johnson to pass us a few minutes later. Fair play to the old fellow (and the young fellow too! ), they must have really belted round the route. I was jealous, as we would be route-finding in the dark. Naively, we were expecting our first checkpoint to be a tent with a couple of organisers and a clipboard, so we ran right past the discreet orange tagbag, only to be informed what we'd missed near the 332m col below A' Chioch. Lesson two for the novice SIPR crew. It was the final bit of running we did for the whole race. 'What's Ben More going to be like in the dark?' I wondered. We caught up with Duncan and Chris, Jamie Andrew's crew, on A' Chioch and together took the traverse too high, contouring on iffy ground before the col below Ben More. Behind and below, headtorches powered up a grassy slope to the same col, arriving first. Lesson three for the novice SIPR crew. It was good to chat to Duncan and Chris, the final scrambling ascent challenging for a runner without a left arm! Prewarned over the magnetic summit, I kept the compass out and watched it turn from north to to 140 degrees out. This could have been an expensive lesson four for a novice crew in bad weather! Fortunately it was a fine night, velvety hills visible against the midnight blue sky, and navigating down to the third checkpoint was not an issue, the hillside alive with pairs of torches, people behind us wisely climbing over the top of A' Chioch in the dark. After the fourth checkpoint Duncan and Chris pulled ahead, Graham astonished at how quickly people were moving over rough terrain. It's something hillgoers take for granted, but it takes practice to move quickly over uneven ground, no matter how fit you are. After a scrabble about we finally found checkpoint 1/5 and walked back to the boat, the dawn chorus starting at Salen in a deep fog. We'd been overtaken by a few crews but weren't quite last down. There had also been some unfortunate teams retiring through injury on Ben More, which had been a particular worry for us. So though we'd not been very fast, we were still in the race - and completing the course in one piece was our only objective. Back on the boat we fell asleep, hoping to wake to new sights. This whole island peaks thing started - like many an idea one lives to regret - down the pub. Four pints into a particularly pleasurable evening and Graeme (with an 'e'), a boat-owning work colleague, dangled the suggestion of a daunder round the west coast by foot and boat. Why not? That I'd considered it a year earlier and rejected it out of hand as too tough was by-the-by. Graeme had bided his time and chosen his moment well. It was a particularly pleasant evening, full of possibilities. What could go wrong? The first inkling that I'd have to up my game came in February. 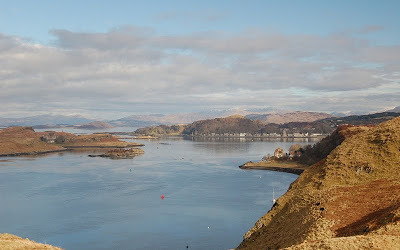 In Oban on business, I skipped away at lunch to recce the Oban dash. Running up Haggart's Brae and Dun Uabairtich was a punch in the guts! My regime - twice a week round Arthur's Seat at lunchtime and the occasional half-marathon - was clearly insufficient. Did I mention I was no fell runner and had never done an event like this before? I started to run the 8 miles to work, and Graham (with an 'h'), my Arthur's Seat jogging partner, agreed to take part too. "At least if we get weather like February we'll be laughing," I said to Graeme. "Are you kidding?" he said. "We'll need more wind than that..."
We met Wilf and Leo, Graeme's crew, off the West Highland Line the night before the race. They'd arrived two nights before and had planned to have a couple of days sailing round Oban but this had not been possible due to a lack of wind - and it wasn't looking good for the Friday and Saturday of the race either. "Some of the other boats are rigged up like galleys," said Wilf. "We've been watching them practice rowing." Our only oars were in the dinghy. Modifying Phoebe, a 32-ft Bavaria cruiser, was not something we had considered. Lesson one for the novice SIPR crew. 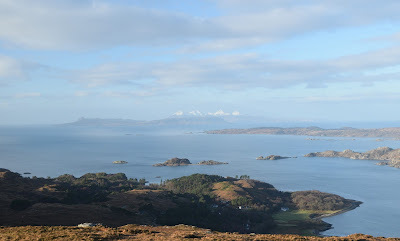 The next morning, as we gathered to run round the Oban route, I tried in vain to spot someone who looked less fit than us. Sinewy, athletic, muscular... the blokes too... "they all look fitter than you," Graeme offered helpfully. We shot off round the course and crossed the start line towards the end of the field, but as soon as the momentum from the engine boost died, we floundered helplessly in Oban Bay, expending most of our effort getting out the way of ferries. Come on guys - only 20 miles to Salen! 'This is hopeless!' we agreed. But out there boats were heeling over and pulling away from us. We only had to get out of the bay and the wind would pick us up. After further interminable rowing - and now right at the back of the field - we finally caught a breath of wind and escaped Oban Bay three hours after Phoebe had crossed the start line. 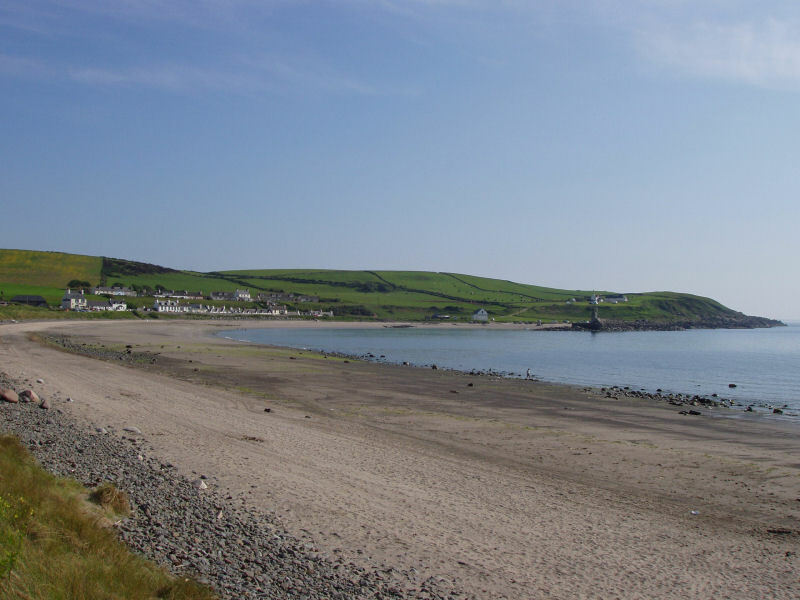 Read on for the next installment..
"Have you ever seen anything like it in Stranraer!" It's as much like Ireland as the rest of Scotland, and was Gaelic speaking as far back as Roman times, thanks to the Scots of Ulster who had a toehold in Argyll and the Rhinns. The whole peninsula of the Rhinns has an insular feel, increasing the closer you get to the Mull of Galloway. The houses are neat and whitewashed, with some rugged seacliffs and pretty beaches. Most notably for those familiar with similar scenery in the likes of overcrowded Cornwall, there are few tourists. Down here the land is rolling and pastoral, with dairy cattle grazing the lush grass. 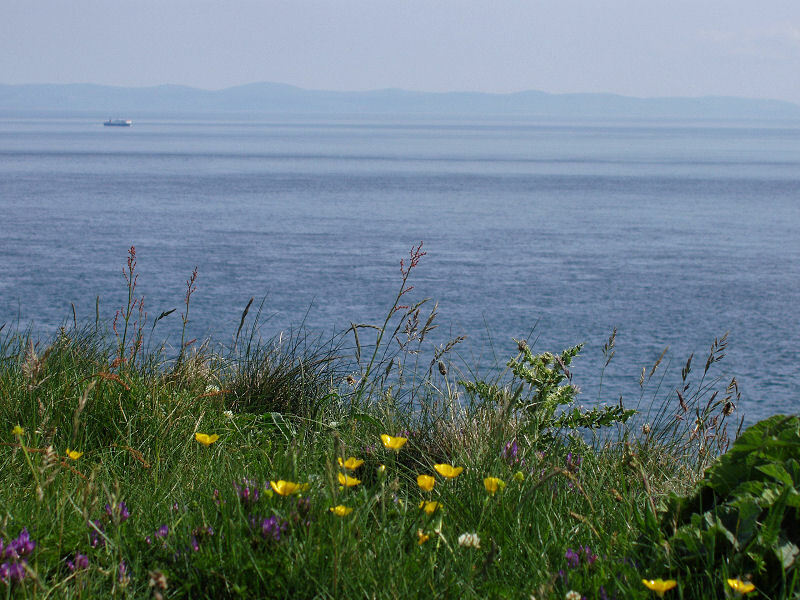 The tippermost tip of the Rhinns is the Mull of Galloway, which holds the distinction of being the southernmost point of Scotland. 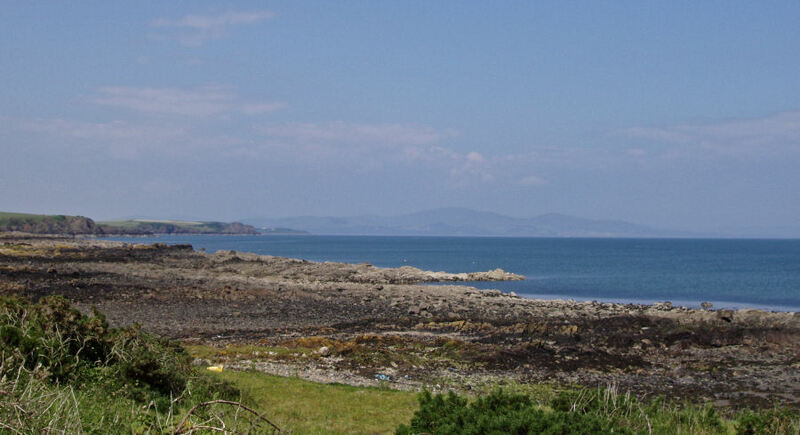 Here the holiday coast of the Solway turns along the North Channel into the palm-fringed riviera of the Firth of Clyde. 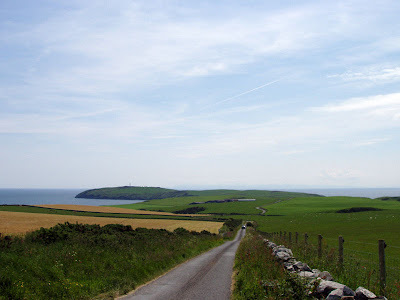 The Isle of Man, Ireland and, on a very clear day, the Lake District, can be seen. Purportedly Snowdonia is also visible on an exceptionally clear day, 133 miles away! The southernmost point is, like the northern and westernmost, a satisfying spot, a definite and scenic edge to the land, with tidal swirls in the water below and wheeling seabirds catching aircurrents on the cliffs. 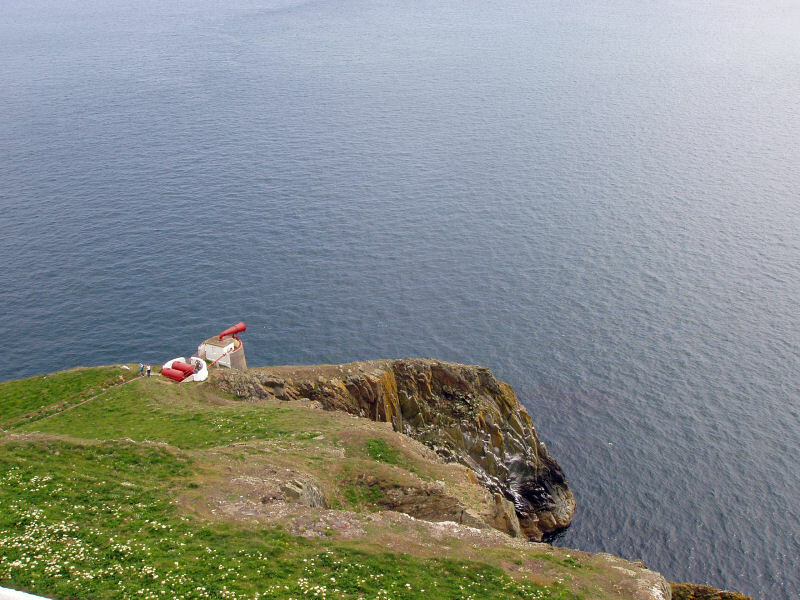 In summer the lighthouse is open to visitors. Now completely automated, this light was last manned in 1988. Thus a little bit of romance borne from the hard and singular lifestyle of the lighthouse keeper has gone from our land, and today the light is operate by remote control from the office of the Royal Northern Lighthouse Board in Edinburgh. The clifftop is awash with wildflowers and, on our visit, a raptor was terrorising the local bird population. There is a discreet, turf-roofed cafe next to the lighthouse, but we were content to have a picnic outside in the glorious sunshine, sitting on the grass and soaking in the Vitamin D. A long winter has given way to a beautiful, warm spring. This is the time of year to look out the tents and bikes and go for a camping trip! But where should you go? The obvious answer is to head for Speyside, the West Highlands, the Lake District, or somewhere like that. But what about Galloway? This part of the world remains a blind spot for many, but the cave-riddled coast was a smuggler's coast, the hills and farmland are rolling and pastoral, the ruined castles once the homes of vigorously naughty lords and the climate as good as any you will get in Scotland. It is the land of palm trees and The Wicker Man. 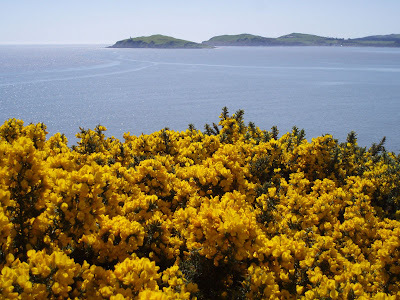 Many people assume that Kirrin Island, the famous location for many of Enid Blyton's Famous Five adventures, is based on somewhere in southwest England. But it would not be surprising if it were based on Little Ross or Heston Island off Galloway. Galloway is a land of slightly strange stories. Away from the busy A75 and A77, the roads in Galloway are fairly quiet, perfect for cycling. 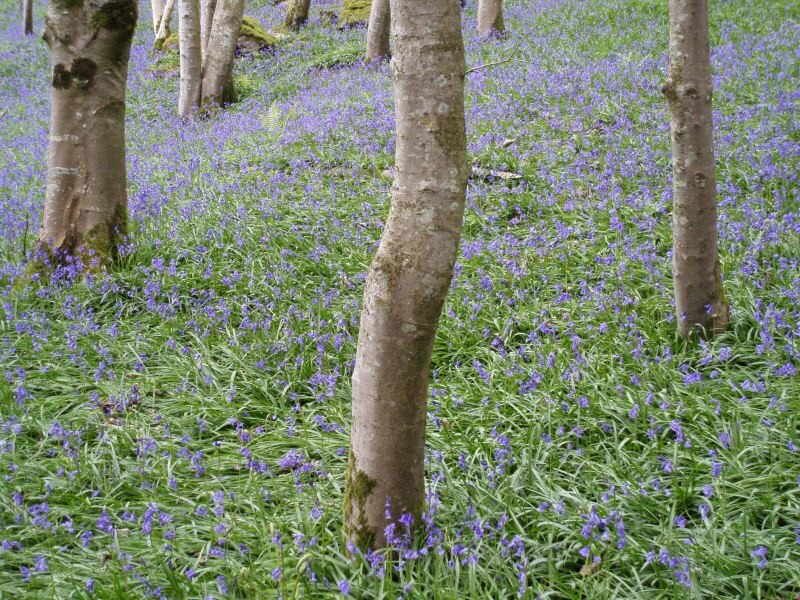 One of the spots well worth exploring is the Machars, the peninsula extending south of the A75 between Luce Bay and Wigtown Bay. You start in Wigtown, a must-visit location for book lovers. Following on from the success of Hay-on-Wye, Wigtown was designated Scotland's official book town, after a competition that included towns like Dalmellington. The idea behind the book town concept is to provide an economic and cultural boost to a deprived if pleasant area, and in the attractive town square the Old Firm replica shirts of the locals mingle with the tweedy outfits of the bookshop owners. The town is, of course, hoaching with bookshops: a book-browser's paradise. 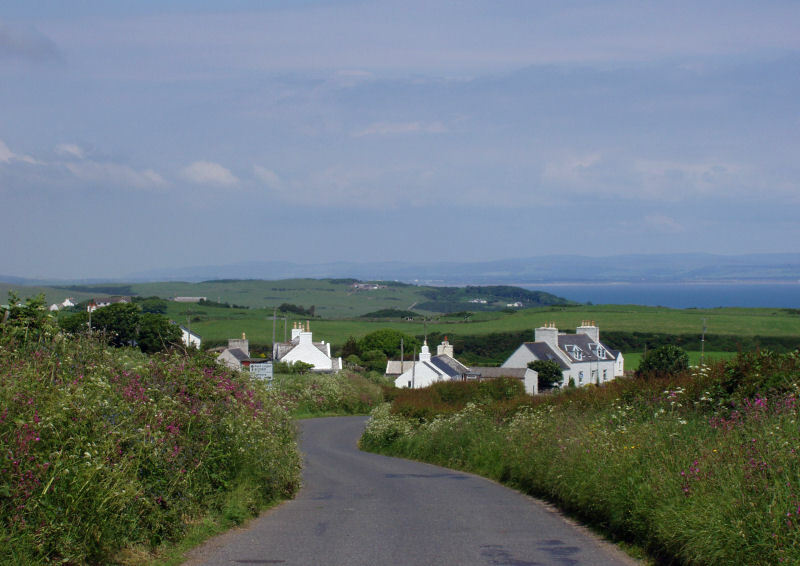 Beyond Wigtown lies the Isle of Whithorn, where St Ninian established a Roman mission in 397. It was the first dedicated Christian establishment in what is now Scotland. There is little ancient to see now except some small ruins, and a sense of peace. 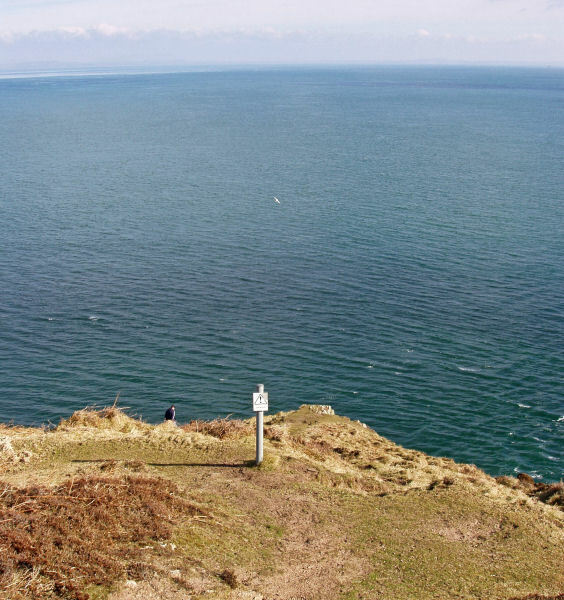 Nearby is St Ninian's Cave, where the saint was said to retire to meditate, and which today is covered in carvings of crucifixes; and Burrow Head, where the climactic scene in The Wicker Man was filmed. The whole area of the Machars is low-lying, understatedly agricultural, with a pleasant coast and villages: you arrive back in Wigtown via Bladnoch, the southernmost whisky distillery in Scotland. Perhaps you'll pop in for a tour before heading back to your campsite south of Port William. With the UK general election out of the way, and the Conservatives with an increased presence in Westminster but no party with a majority of the seats, how did Scotland fare in the election? Out of 59 seats, after all the expenses rows, worries over the economy and public services, after all the heat and light generated in a near two year campaign, *not a single seat* has changed hands on 2005. I'm gobsmacked at the sheer statistical unlikeliness. I wonder what the odds on that would have been?